A quality de-esser that does everything that it should. Simple uncluttered user interface. Successfully de-essess a wide range of material. Auto Level Tracking helps hide unwanted side-effects of de-essing. Sibilant vocals are annoying. You could have a vocalist who sounds great in real life, but the studio mic throws up a whole heap of problems. Each time a word is sung that has an 's' in it, there's a volume leap and a sound like a hissing snake, while 't' 'f' and even 'ch' sounds can cause problems, too. A de-esser works by analysing the incoming vocal signal and attenuating the frequency range that's causing the problem whenever it exceeds a user-speciﬁed threshold. 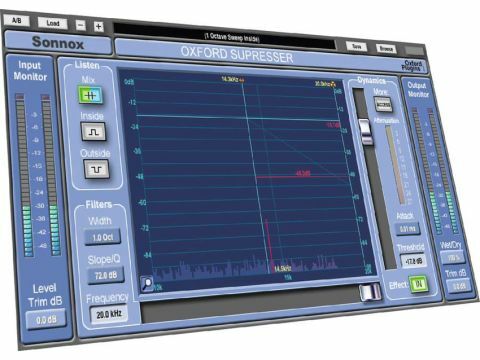 SuprEsser requires an iLok for authorisation, and once the painless installation is finished, the first impression is one of a solid, no-nonsense audio tool. The main window gives you quick and easy access to the most important parameters - the frequency range you need to de-ess, by how much, and at what threshold the plug-in starts doing its work. There's a fair supply of presets included with the package, but to get the best out of any de-esser you have to set it up manually. The most interesting feature here is Auto Level Tracking, which eliminates the need to adjust the de-essing threshold as the track progresses. Auto Level monitors the overall level of the track. SuprEsser is exactly what its name implies - a professional level tool that, with some careful setting up, can de-ess anything you throw at it. Sonnox has turned out a solid, stable solution that feels professional and sounds great. At £162, it's not particularly cheap, but if you need a quality de-essing solution, you'll consider this a price worth paying.